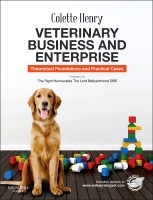 Welcome to the website for Veterinary Business and Enterprise - Theoretical Foundations and Practical Cases, by Colette Henry FRSA, FISBE, Norbrook Professor of Business and Enterprise at the Royal Veterinary College (RVC), London, UK. This site hosts a range of materials supporting the text Veterinary Business and Enterprise - Theoretical Foundations and Practical Cases that help bring the subject to life. The website presents a series of practical case studies that illustrate contemporary challenges in veterinary business management. They have been prepared by leading academics in veterinary, business and enterprise disciplines from leading universities and colleges, and are fully interactive. Alongside the video lectures (when available), there are comprehensive teaching and learning notes for both lecturer and student. Key learning objectives are identified and explored.